I just got my SM knobs in the mail and that would normally be a good thing EXCEPT....They don't want to slide onto the CTS pots that came in the BCS wiring kit I ordered. I don't want to force them as they sound like they are ready to crack at the slightest bit of push. Anybody else have this problem? I made sure the splines were lined up but it's a no go. I also wanted your guys take on copper shielding the control and switch cavity. Does it make a difference? Is it worth the time and materials? If it is I would like to do it but wanted a few opinions first. The stuff is going in a BullDog LP kit I am putting together. I have a set of Duncan JB and JAZZ PUPS for it along with the Vintage BCS wiring kit if that makes any difference. Import/metric/ knobs trying to fit on 'standard'/inches pots. Do not pass 'go', don't try to push them on the pots---you'll just break the shafts. Shielding won't make a difference. Not one of my guitars has any shielding, if that makes any difference to you. Many others, too. Including every Gibson & Fender in the 50's. The stuff is going in a BullDog LP kit I am putting together. Watch out for those "BullDog" LP's. We have 3 in the shop right now, and none of them are "right". If you'd like to know what's wrong with the 3 that customers have brought in for us to "fix", I'll tell you privately. I have my strat shielded.. and I think it does make a difference. But you know some people think PIO Caps change the tone and other don't.. It holds true about shielding cavities. I don't shield my Les Pauls. I am amused when guys disagree with you, Hillbilly. Holy cow, that's alot of copper. 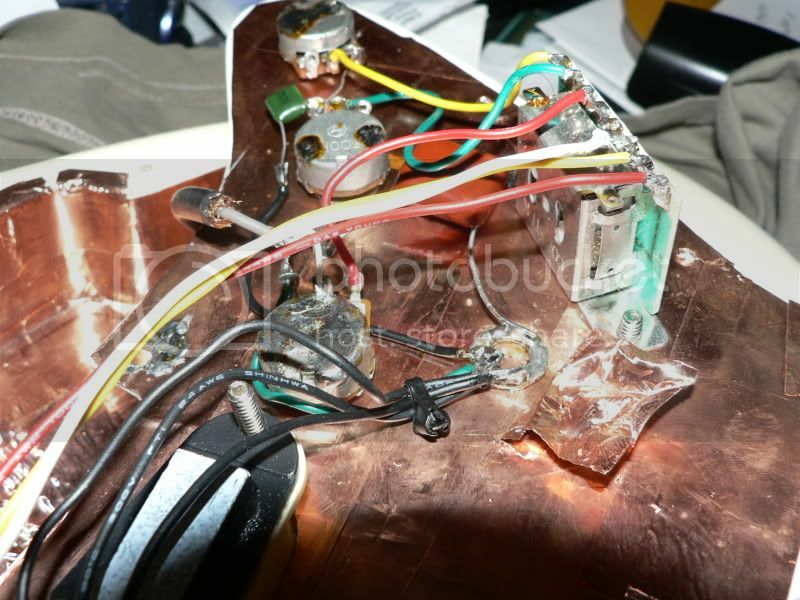 Connect 1 wire on the "pickguard" side of the copper tape to the "body" side of the copper tape, then connect 2 wires to your meter, and let's see that meter result. I'd be interested to see the result, either way the meter reads. I find it amusing that everyone think certain people opinion is gospel. You want me check the capacitance? What will be the dielectric? I don't see where I said anybody's word was gospel, but when a guy does guitar electronics for a living, I'd think he knows a bit more than the average guy. You see we all have our opinions.. If you take your car to a mechanic have them look it over. They will find issues with the car.. Have them fix it.. take it to another shop after the repairs and they will find an issue with it. So who will be the average person? I see it all the time.. Had a customer had a compression stall on one of his engines. I went there to inspect the engine and found that the coating on the compressor blades missing. The customer wanted me to inspect the other engine and found the same thing. This is a clear sign to remove the engine and have it overhauled. The Engineers of the Engine OEM manufacture said the 2nd engine didn't need to be overhauled. The aircraft sat for 60 days and we installed the overhauled engine. Took it out for a test flight and then the 2nd engine had a compression stall. So that engine had to be removed and the aircraft sat for another 60 days. Just because the Engineers thought they knew more than the average guy. I've been working on my guitars for over 20 years so at what point do I pass the "average guy". Just because I don't do it professionally doesn't mean I don't know what I'm talking about. I not once said the Hillbilly was incorrect. The OP asked about opinions and I gave mine.. DTD decided to hijack the thread and it became a who has the bigger e-penor contest. I will not reply to this thread again unless OP ask me a question. The dielectric, in this case, is air, with a constant of 1.00054. So, it's reasonable to assume that because you have 2 parallel plates with an area A (copper foil on the pickguard --Plate #1, and copper foil in the cavity -- Plate #2, each with their own area, held parallel with 8 to 11 screws), and a distance separated by distance 'd' (I don't know what the distance is between a pickguard screwed down on top of a guitar body, but it's damn near nothin'...), that there is capacitance within the circuit. 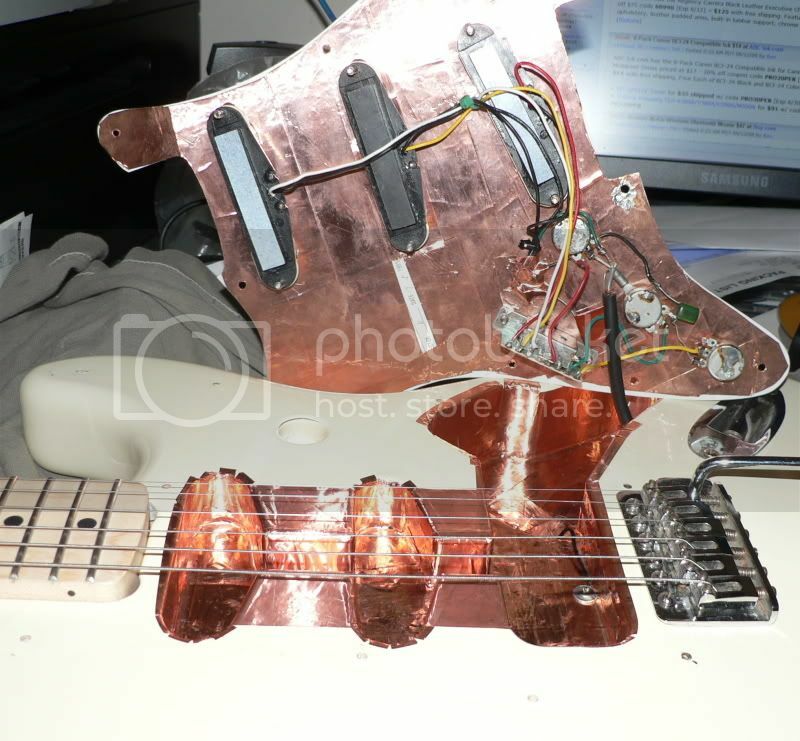 I jest in the spirit of good humor, but there is a sonic difference between über-shielded and un-shielded guitars. I'm the farthest thing from the clergy. The only problem I see is plate #1 and Plate #2 will be touching. So there really isn't separation between plate 1 and plate 2. All the shielding is doing, it's a enclosure like your stomp boxes and even computer cases. I haven't really used that engineering degree since college, but even a high school algebra student would recognize that if the distance "d" is in the denominator of the equation (you acknowledge the value of "d" is very small), then the capacitance would be VERY high (in theory, approaching infinity). You don't really mean this, do you? Or, if d=0, the equation becomes a non-starter (cannot have zero in the denominator) and would not apply. In another thread, you measured the capacitance of the foil in a customer's guitar and said it was .047 mfd -- hardly a large value. Isn't the point of shielding to eliminate noise and interference and not to alter the "tone" of the instrument? For example, like a Faraday Cage? That's what I always thought. If you're not getting any noise, then there shouldn't be a need to shield the electronics cavity. And noise could also be an indicator of a grounding issue, no? Or am I missing something? Just for single coil.. Humbuckers already cancel each other out. Like I mentioned before it's like the PIO theory some say there is a tone change and other say there isn't. Just like the shielding. My strat cavity is just a enclosure and the only way it's connected to the circuit is ground. Just like an aircraft sitting in a metal hangar that is grounded. The metal hangar isn't one big capacitor just because it's grounded to the hangar.